After a draw at Hampden last Sunday, a revisit there on Tuesday night may well be in the minds of some, however the relative merits of winning three points this weekend against Dundee United could be argued as a whole lot more important, even moreso than a qualification into the UEFA cup next season. With the 33 game mark now reached, Scottish Football manages to do what no other "elite" league in Europe does as it splits into two sections. The arguments over such a split will rumble on for at least another season now, but as it is Dunfermline face the five sides directly above them as they aim to claw back the four point gap that separates them and St. Mirren. However, four points is the gap and a very in form Dundee United form the stiff opening test of the final part of the league season that has seen far more downs that ups so far. Having only won five games all season (including those two of the last three) some positives can be taken from the fact that Dundee United are one of the few sides to have lost to Dunfermline this season in the SPL. Jim Hamilton v Lee Wilkie. That win, officially under the caretaker manager Craig Robertson, saw Stephen Kenny take a bow before the Dunfermline crown before the match. Kenny settled down to watch a side soon to be under his management, however he decided to introduce himself earlier than planned and made a visit to the home dressing room at half time! Whatever those words may have been, it is certain they did not involve Dundee United taking an early second half lead, which is exactly what they did through a man who is always a threat to Dunfermline, Barry Robson. Thankfully, The Pars rallied and late goals from two very unlikely sources in the way of Greg Shields and Gary Mason. Mason`s late winner came after a lung bursting run by Stevie Crawford to keep the ball in at the bye line, when it looked to be safely running out of play. Freddie Daquin played the slightest of touches to put the ball perfectly in the path on the quickly incoming Mason and the three points were Dunfermline`s. The other two matches between the sides, both at Tannadice, have had far less to write or cheer about. 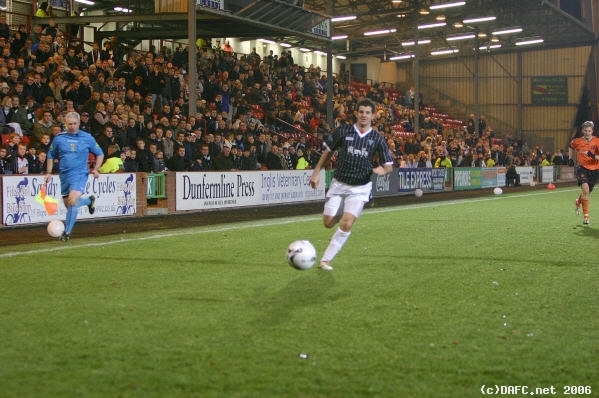 The first game up in Dundee saw Mark Burchill win, then miss, a penalty as his effort hit the post and bounced out to safety. The second match on Tayside saw even less action on the day and the game ended in a second 0-0 draw. However, goals have not been so hard to come by for United in recent times. Their last two away matches, which many would have predicted as being back to back defeats for them, have seen a remakable 4-0 win at Tynecastle followed by a 4-2 win at Pittodrie. These wins came either side of a battling 1-1 draw against Celtic at Tannadice. Craig Levein has always received plaudits for making his teams difficult to beat, but they`ve also found their shooting boots in recent weeks. Barry Robson may, apparently, be rested for his own good until the end of the season. He scored a hat trick in that 4-0 win over Hearts, but was sent off in the 1-1 draw against Celtic. One more booking will result in a FOUR game ban for the United captain at the start of the 2007/08 season and Levein is giving series consideration to leaving Robson out of his plans. Robson apart, United`s goals have come from numerous sources. Ex Pars striker Noel Hunt has finally managed to reach double figures for the first time in his career, with his goal against Aberdeen being his tenth for the season. Hunt has yet to score against his former employers in three attempts, it remains to be seen if he will celebrate with his trademark backflip in front of the supporter`s who were so patient and supportive of him during his spell at East End Park! Alongside him will be Derek Stillie of course, the legal eagle who loves to noise the crowd up from time to time. He can often be relied upon for a high profile clanger or two, here`s hoping he keeps it up!